Additionally, the camera also has a time-shift collage mode that takes up to four photos sequentially with a time delay. You can set this delay anywhere between 0.2s and 2.0s. The multiple photos can then be printed in one frame. Like the original SQ10, you can do basic editing, using filters and standard adjustments in-camera. The camera has an internal memory that will hold up to 50 images or 30 seconds of video, which can be expanded via microSD card (not provided). 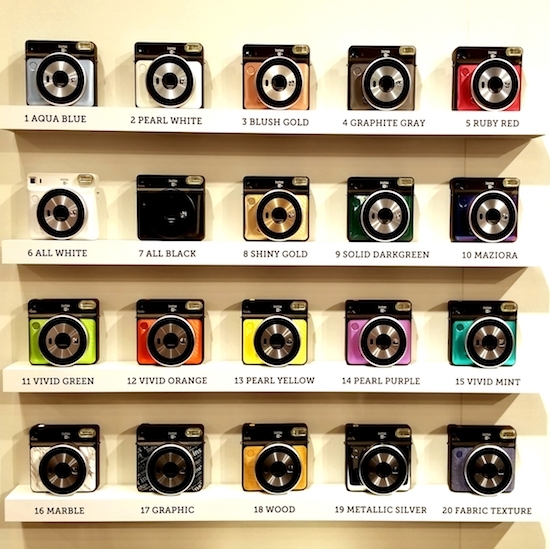 Fujifilm also announced two new colours for their SQ6, a square-format instax camera that was announced earlier this year. The camera will now be available in Ruby Red and Aqua Blue, in addition to the three original colours: Pearl White, Blush Gold and Graphite Gray. They also announced new instax double-sided stickers, available in October, to enable users to stick instax film to a variety of surfaces, quickly and easily. The new products are expected to be available in late October.